It has come to me several times that “normal” people who are not interested in a show puppie are too afraid to call me asking to buy a puppie! I am very sad to hear this as I love to sell to “normal” people. And what do I mean by “normal” people? 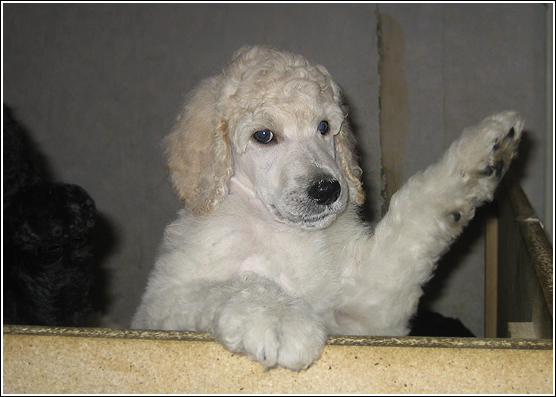 This is a family who want´s to buy a Standard Poodle and have it as a family member. Maybe they want to do obedience, Agility or work with it or just have it as a companion and family member. I love to sell to these people as they will love the dog no matter how it will look like and the dog will be treated well and loved! I know I am not the best to put out pictures with dogs running free, working or just relaxing in the sopha. I am just really bad at taking pictures. This includes my family and children as well. Sorry to admit. I am better on other things. I have some lovely puppie buyers through the years and to some of them I get a great relationship and even friendship for life. When I breed a litter it´s basiclly for myself. I want to breed and keep something to develop and continue my breeding with. Regarding the shows I know how much work it is and I could never ask for someone to put in all this time and work if they didn´t want. My goal is not to break the record in breeding the most champions in the world or get most titles. This doesn´t really say anything about the overall quality. I want to have top of the line and try to stay there. So I keep the ones I think suite me were I am at the moment and what I need to improve and I show them. If you are willing to put down the everyday work with your Standard Poodle I am more than happy to help out to do the Showgrooming and help out to handle the dog at the shows or help you how to become a good groomer and handler with your dog. If you just have the companion dog the most important is to make sure it is groomed and clipped so it just looks nice and keeps healthy. So what I try to say is that if you are looking for a nice pet Standard Poodle we have that as well and there is nothing strange with that. I hope this will help you to at least make a call to us and talk about Standard Poodles. It also happens that we get puppies that are not a showdog. I do have a lot of experience and I do know what I am doing. I really try to keep up the health no matter what others say, the temperaments for me is a must. A Poodle with a bad temperament is not a Poodle and I would never continue breeding to this. ← Simon is currently #2 Dog Of The Year in Sweden, Allbreed system!